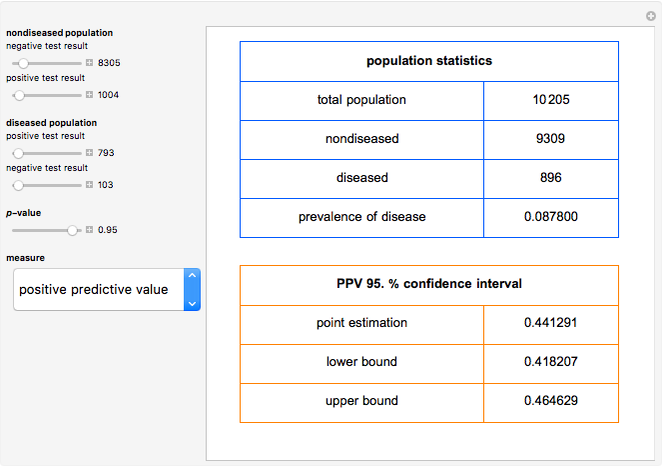 This Demonstration shows calculations of point estimations and confidence intervals for various accuracy measures of a diagnostic test for a disease. This is done for differing negative and positive test results of nondiseased and diseased populations and differing -values for the estimations of the lower and upper bounds of the confidence intervals. The calculated measures are the sensitivity, the specificity, the positive predictive value (PPV), the negative predictive value (NPV), the (diagnostic) odds ratio (OR), the likelihood ratio for a positive test result (LR+) and the likelihood ratio for a negative test result (LR−). The measures can be selected using the menu. 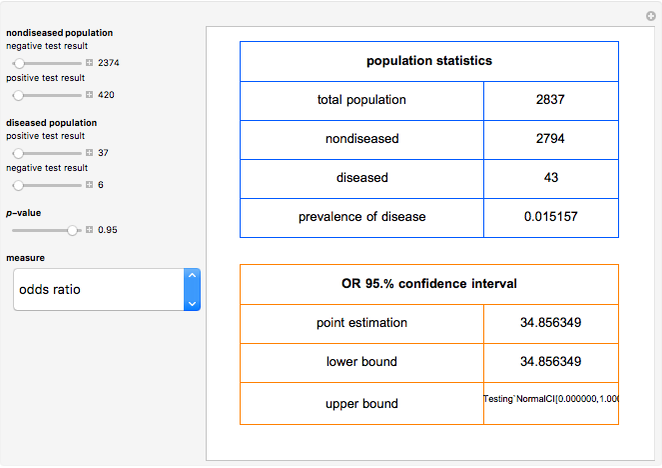 The negative and positive test results of the nondiseased and diseased populations, along with the -value, are chosen using the sliders. The Wilson score method with continuity correction is used  for calculating the confidence intervals of the sensitivity, the specificity, the positive predictive value and the negative predictive value. For the calculation of the confidence intervals of the (diagnostic) odds ratio, the likelihood ratio for a positive test result and the likelihood ratio for a negative test result, it is assumed that their natural logarithms have asymptotically normal distributions . This Demonstration is an extension of another Demonstration  and is appropriate as an educational and research tool. J. L. Fleiss, B. Levin and M. C. Paik, Statistical Methods for Rates and Proportions, 3rd ed., Hoboken, NJ: J. Wiley, 2003. 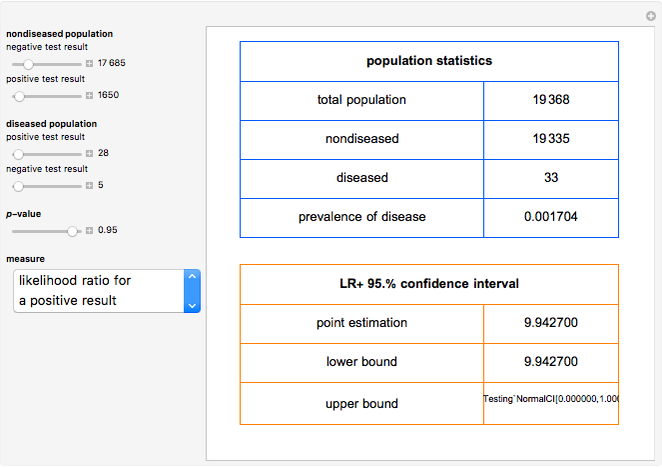 T. Chatzimichaill, "Calculator for Diagnostic Accuracy Measures" from the Wolfram Demonstrations Project—A Wolfram Web Resource. demonstrations.wolfram.com/CalculatorForDiagnosticAccuracyMeasures. Theodora Chatzimichail and Aristides T. Hatjimihail "Calculation of Diagnostic Accuracy Measures"